My name is Devon Smith. I am twenty-two years old, and originally from Charlotte, North Carolina. I have lived in the upstate of South Carolina for the past four years while attending college. I am the youngest of four children, with two wonderful parents who raised us. Having three older brothers was an adventure growing up, and there was seldom a dull moment! I recently graduated from the University of South Carolina Upstate in May of 2010 with a Bachelor’s of Science Degree in Nursing. Shortly thereafter, I obtained my Registered Nursing license to practice nursing in the United States. Sometime late this fall, after October, I will be joining the Navy as an Officer in the Navy Nurse Corps, and will have the great privilege of serving the men and women of the Armed Forces. Until then, I am headed for Haiti!!! Many NGOs can’t be trusted, and governmental organizations bury their assistance in bureaucracy. Samaritan’s Purse is the best thing going, and you have a chance to participate via PayPal. Visit Heading for Haiti. To be fair concerning the brief things I am about to say (and quote), you may go directly to the Sustainable Defense Task Force Report and read the analysis and recommendations yourself. For now, the summary report at the Marine Corps Times will suffice. An independent team has made a series of recommendations to Congress to reduce future Defense Department budgets, in light of the country’s growing deficit — including big cuts to the Corps. The team, dubbed, The Sustainable Defense Task Force, was tapped for the project by a bipartisan group of lawmakers. Their suggestions could reduce defense spending by $960 billion from 2011 to 2020. • Roll back the size of the Army and Marine Corps as the wars in Iraq and Afghanistan wind down. The U.S. could save $147 billion over the next decade by reducing the Army’s end strength from 547,400 to 482,400 and the Corps’ from 202,000 to 175,000, the task force says. • Reduce the number of maneuver units in the Army and Marine Corps. The task force suggests reducing the number of Army brigades from 45 to 42 and the number of Marine infantry battalions from 27 to 24. Doing so would contribute to the $147 billion in savings as the services reduce their end strengths. • End the fielding of new MV-22 Ospreys. The Corps could save $10 billion to $12 billion over the next 10 years by buying new MH-60S and CH-53K helicopters, analysts say. The K variant of the CH-53 is not expected to hit the fleet until at least 2015, but the Navy began replacing outdated CH-46 helicopters early this century with the MH-60 on amphibious assault ships. • Kill the Expeditionary Fighting Vehicle program and field cheaper alternatives. The Corps could save at least $8 billion in the next decade by refurbishing cheaper, existing amphibious assault vehicles instead of continuing development of the yet-to-be-fielded EFV, the task force says. • Reduce military recruiting budgets. The task force does not provide a service-specific breakdown, but says that with a military drawdown underway, the U.S. will not need to spend as much money finding new recruits. Recruiting budgets could be reduced by $5 billion over the next decade. Some of the proposals — killing the EFV to save money, for example — are hardly new. But the report also includes a second set of proposals authored by Benjamin Friedman and Christopher Preble, analysts at the conservative Cato Institute in Washington. In a five-page section at the back of the task force’s 56-page report, the two analysts propose a “strategy of restraint — one that reacts to danger rather than going out in search of it.” If adopted — a big “if” — it would result in deep cuts to the Army and Marine Corps, with the Army reduced from about 560,000 soldiers to 360,000, a 36 percent reduction, and the Corps reduced from 202,000 Marines to 145,000, a 28 percent decrease. The cuts would make the Corps smaller than it has been at any time since 1950, when there were about 74,300 Marines on active duty before the U.S. took an active role in the Korean War. No, here is what’s absurd. Pretending that this has anything to do with saving any significant amount of money via defense cuts. 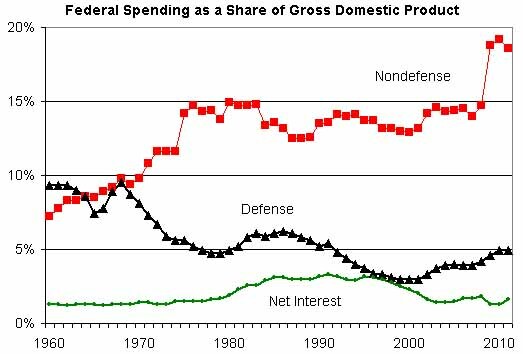 Recall that we have discussed this depiction of defense spending as a function of GDP (via Instapundit). This graph also comes from the Cato Institute. Maybe the analysts at the Cato Institute should talk to each other a little more. You know, maybe some staff meetings or hallway discussions or something. Maybe they should do lunch. With the Obama administration having thrown several trillion dollars into toilet to be flushed away without doing any good whatsoever, the focus on defense spending is disingenuous and hypocritical. Right before the executive summary, the following quote is strategically placed. Conservatives needs to hearken back to the Eisenhower heritage, and develop a defense leadership that understands military power is fundamentally premised on the solvency of the American government and vibrancy of the U.S. economy,” Kori Schake, Hoover Institution Fellow and former McCain-Palin Foreign Policy Advisor. Nice try. Let’s cut billions out of defense spending in order to counterbalance the trillions we throw away on social engineering programs so that if we ever really do need defense again after we have managed to control ourselves and stay out of fights with the enemy, maybe we will have spent so much on non-defense we will have curtailed our drunken appetite for throwing money away and we can get down to business defending ourselves. The problem is that the enemy gets the majority vote. Say what you want about the expeditionary warfare concept, the 100 or so nations in which we currently have troops deployed and based, and the supposed meddling we do in the affairs of others. It keeps the fight abroad instead of at home. For those who wish to wait for the fight to come to our doorstep, be careful what you wish for and consider just what it would be like. I have been as hard on the big plans for the Marine Corps as anyone. I dominate Google rankings for expeditionary warfare and the Expeditionary Fighting Vehicle. I oppose it (the EFV) in all its manifestations. I have advocated a much lighter, and more air-mobile Corps, with reliance on forcible entry via air (a new helicopter fleet) rather than via sea, to allow the Navy to set up shop after the Marines have secured a beachhead. Relying on the hugely expensive and very heavy EFV is profoundly unwise. I have also opposed the money for the F-35 because it isn’t half the aircraft that the F-22 is, and it has had halting production efficiency. But the authors have crossed the Rubicon. They’re talking about massive reductions in infantry battalions. Don’t be fooled. Good Infantry Battalions can’t be stood up easy, cheap or fast. We are left with our pants down if we follow the advice of this report sanctioned by this group of bipartisan lawmakers. And for the record, while I like the generally libertarian approach to domestic lawmaking, Ron Paul’s views of national defense are naive and childish. Any study co-sponsored by Barney Frank and Ron Paul should immediately raise your hackles. In the future, I have a better idea for saving money. Rather than pay these analysts to reiterate this same claptrap, next time pay me ten percent of what you would otherwise spend and I’ll cut through the crap in one tenth of the words. One tenth the words for one tenth the cost. If Congress doesn’t recognize that as a deal, they can’t be trusted with our money. The pitiful Hamid Karzai had a peace jirga in June. Astonishingly, it appears that it wasn’t very successful. Afghan President Hamid Karzai’s peace jirga earlier this month was pretty close to a bust. Powerful northern rivals were conspicuously absent, as were the Taliban, who instead dispatched a pair of suicide bombers to disturb the proceedings, detonating not far from where the conference took place. The violence, however, overshadowed a rare moment of unity among influential lawmakers and elders: a full-throated call to release of hundreds of prisoners, possibly even including Taliban, languishing in Afghan and U.S. military jails. In yet another affirmation of his will to end the Taliban-led insurgency through compromise rather than the end of a gun, the President said the jirga’s demand compelled him to act quickly to free those prisoners who might oppose his government but have not been convicted of alleged crimes. The goal, he went on, was to build goodwill with “disenchanted people” in league with the Taliban. Later in June, fourteen Taliban prisoners were released as part of this agreement, and another twenty eight have been released just in the last several days. In fact, this is only the beginning. The flood gates could soon open, culminating in the release of as many as a thousand Taliban. The head of Afghanistan’s most notorious prison says nearly 1,000 Taliban inmates could be freed from Pul-e-Charki prison as part of an amnesty deal offered by Hamid Karzai’s government. 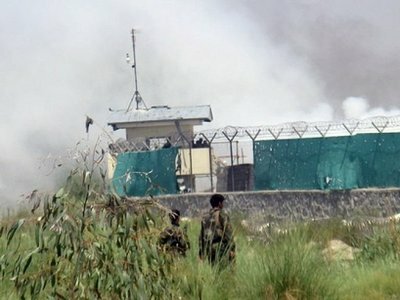 The figure, revealed by General Abdulbakhi Behsudi, the warden of Afghanistan’s largest prison, in an interview with The Globe And Mail, suggests the potential breath of the prisoner release ordered under the terms of a controversial resolution issued by Afghanistan’s peace jirga, an assembly of tribal elders convened last week to pave the path for negotiations with the Taliban. Mr. Behsudi keeps a collection of evidence confiscated from these inmates in a locked glass cabinet, proof, he said, of their intractable criminal minds. There are dozens of battered cellphones used to issue orders for suicide bombings; $1-million worth of heroin and hash buried inside the soles of shoes, stuffed inside a hairbrush, and lining a false-bottomed cooking pot. There is a braided rubber whip seized from cellblock D, used by the insurgents to punish any inmate who crossed them. “These people will never be loyal to the government because they are dark thinkers, they think dark things,” said Mr. Behsudi, a heavy-set man dressed in crisp army fatigues, brandishing a sword confiscated from a prisoner’s bed. Pul-e-Charki has about 4,620 inmates, he said, with the Taliban forming the most cohesive category of prisoners. Only a small fraction of those – the ones caught with “a smoking gun” – would be exempt from Mr. Karzai’s proposed amnesty. While we are attempting to separate the insurgents from the population, go to great (and deadly) lengths to avoid collateral damage when fighting the insurgents, and have many thousands of American warriors deployed in theater to protect the population and kill the insurgents, Karzai is releasing them back into the population to start all over again. President Obama’s decision to shift the U.S. military chief for the Middle East, Gen. David H. Petraeus, to focus exclusively on Afghanistan highlights what politicians, analysts and some U.S. military officers here say is a serious drift in policy toward Iraq. Iraqi officials said they had detected a lack of direction even before Obama tapped Petraeus to replace his commander in Afghanistan, Gen. Stanley A. McChrystal, who stepped down this week after he and his team made disparaging comments about U.S. civilian leaders. The Iraqis describe U.S. Embassy officials in Baghdad as obsessed with bringing an end to the large-scale U.S. troop presence in Iraq. They believe the embassy’s single-mindedness has often left the United States veering from crisis to crisis here. Some U.S. military officers and Western analysts have also criticized what they see as a failure to think beyond the planned drawdown to 50,000 noncombat troops by the end of August. The lack of focus may leave an opening for Iraq’s neighbor and the United States’ rival — Iran. Iraqi officials are eager to take back control of their country. But some worry that the U.S. administration is blinding itself to the need for continued engagement. The insurgency in Iraq is down, but certainly not out. It is especially troublesome in the Diyala Province and on to the North. Something resembling regular combat operations still ensues in parts of Iraq. It was a tip-off about a weapons cache that drew the U.S. soldiers of Charlie Troop away from their Stryker armored vehicles in the densely populated Iraqi town of Jalawla one Friday morning last month. That was when the suicide bomber struck, detonating a car bomb so “catastrophic” that details of the attack that killed Sergeant Israel O’Bryan and Specialist William Yauch are still hazy, their commanding officer said. One thing was clear: the insurgency in Jalawla won’t lie down. Like other towns across Iraq’s restive northern provinces of Diyala, Kirkuk and Nineveh, Jalawla defies the U.S. narrative of an end to combat operations next month under a plan to pull out of Iraq completely by the end of 2011. For the ethnically and religiously-mixed arc running from Jalawla near Iraq’s eastern border with Iran to the western frontier with Syria, the transition on August 31 is less a milestone than a matter of semantics. Operations that to outsiders will look pretty much like combat will continue in areas where a stubborn Sunni Islamist insurgency remains entrenched, despite a sharp fall in overall violence since the height of the sectarian slaughter in 2006/07. They will, however, be called “stability operations,” loosely defined as advising, assisting, training and equipping Iraqi forces — a role U.S. forces have had for some time. I have long lamented the extent to which the Status of Forces Agreement has left U.S. troops nearly powerless to do anything other than force protection. But rather than revisit this agreement, engage the Iraqi government, put serious pressure on Iran, and get set for serious long term engagement with Iraq, the Obama administration is demonstrating an even more careless cut and run attitude than in Afghanistan. Obama even sent the un-serious Biden to encourage Iraq to seat a government (a fact not lost on Azzaman which observed that Biden’s recent visit did nothing to weaken Iran’s grip on Iraq). This attitude will undoubtedly redound to our loss in the Middle East, and the further empowerment of Iran. It also bespeaks the low esteem that the administration has for the men and women who sacrificed so much to bring the Iraqi insurgency to heel. How sad and tragic would it be for the memory of our fallen warriors to allow the devolution of Iraq into chaos again? presence as British forces redeploy, leaders said. British Defense Secretary Liam Fox said the 1,000 British marines deployed to the Sangin area of Helmand province are moving to the central part of the province by the end of 2010. U.S. Army Lt. Gen. David Rodriquez, commander of the International Security Assistance Force Joint Command in Afghanistan, said U.S. Marines were increasing their presence in the northern and southern parts of Helmand as British forces redeploy. “The British are committing their theater reserve for the next several months into the central Helmand River valley to increase the security zones in the central Helmand River valley,” he said. International forces pushed into the Helmand district of Marja earlier this year to wrestle control away from the Taliban. Taliban forces, however, have shown resilience prompting the general to say patience is needed in the fight against Afghan insurgents. Rodriquez said the political situation was advancing, however, as local residents grow accustomed to a formal regional government. “As security grows and as the confidence of the people grows, it will become more representative of the whole district of Marja,” he said. I see. I’m glad that we got that one all cleared up. So the ISAF or the Marines screwed up by not getting the government ex-machina in there quickly enough. Government is the answer to all counterinsurgency problems. It had nothing to do with the work of long term counterinsurgency, or Taliban fighters and the fear of them by the people of Marjah. If we had sequenced it better it would have been like clap-on lights. Presto! No more enemy – the place is safe, secure and serene! They can’t let go of this childlike belief in the magic of COIN doctrine. Or, more accurately, someone in the ISAF, or the Pentagon, or their counselors, has convinced themselves that COIN can be done in one tenth of the time it really should take, simply because the President has set an unrealistic time table for troop withdrawal. It’s called intellectual dishonesty, and it pervades the campaign in Afghanistan. An episode last month illustrates the quandary American troops face. In early June, on the southern edge of Kandahar city, a small Army convoy drove into a nighttime ambush. Within seconds, a turret gunner in one of the vehicles was hit in the arm. Muzzle flashes pierced the dark, alerting fellow troops to where the shots were coming from. But, thinking that they had to clearly identify the triggerman before firing back, they waited before retaliating, even as rounds of hostile fire poured in. Only after an officer radioed back with the go-ahead did the Americans return heavy fire. By then, the militants had melted away. In Marjah, the desert town in central Helmand province where U.S. Marines are battling a resurgent Taliban, roving groups of militants on foot and motorbike take potshots at the Americans when they are not setting up ambushes and IEDs. Yet even if Marines see an attack taking shape around them, the current rules of engagement mandate that they cannot shoot unless they are first shot at. The insurgents know this, so they often “drop and go”: firing from a distance, then abandoning their weapons. Sometimes Marines never get a single shot off in defense, an exercise in restraint that is especially taxing for the American military’s hardiest warriors. But without weighing in again on the restrictive nature of the ROE in Afghanistan, I will only observe one more time that while the rules for engagement of the enemy in Iraq were too restrictive, or so I argued, they were not the same as those in Afghanistan. Period. There is a difference, and you can judge for yourself how successful each campaign has been. For a reminder of how insurgents were engaged in Iraq, see Recon by Fire (or what some commenters called the “Drake Shoot”).